Why Do We Protect Art? Museum objects are fragile pieces of history that are meant to inspire, enrich and educate people. When an object becomes a part of a museum's collections, the museum makes a long-term commitment to care for it so that it may be enjoyed by generations to come. The museum must strike a balance between providing public access to objects by exhibiting them, and keeping objects safe from potential harm caused by temperature and humidity variations, human touch, light levels, pests and air pollutants. Museum personnel take their roles as stewards of cultural history very seriously. They go to great lengths to safeguard collections to ensure that they are displayed in pristine condition for as long as they can be maintained. This is why the museum displays many objects in protective Plexiglas cases and why "Please do not touch" signs are posted, reminding visitors of the fragile nature of museum collections. 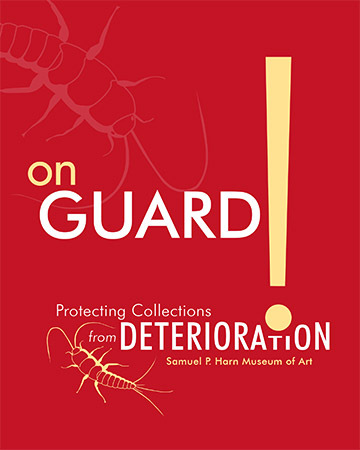 View our publication on protecting collections from deterioration.